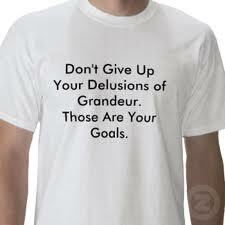 GRANDIOSITY: What Are The Four Components To Narcissistic Grandiosity? 1. Omnipotence (having unlimited power): The narcissists grandiose fantasies serve to preserve their belief in their “God-like” omnipotence. Their magical thinking is a symptom of their obsessional neurosis that they are all powerful. Preserving this belief, they feel powerful in the knowledge that they can excel at anything they choose to do; they will be a winner by applying their “Divine” mind to the task, whatever it is. Without this grandiosity they would have to face the reality of their own shortcomings (abilities, education, overwhelming fears), which they deny to theirselves fervently. 2. Omniscience (having infinite knowledge): The narcissist likes to present themself as “all knowing”. In their head they are the authority, the sage, the guru. They set up their own cult following, with all their little devotees hanging on to their every word, and they are the Master. Obviously, they do not know everything, so when there is in any danger of being exposed, they lie and stretche the truth beyond recognition. Rather than admit that their knowledge escapes them they will resort to lies in order to protect their false superiority, and will quote untruths to make themselves look the expert. They constantly transforming themselves, like the magician, using slight of hand in order to manipulate objects around them. With age they may even metamorphose into a “Divine Being”, Avatar within their own territory. Having not achieved academic achievements through conventional education, narcissists may become autodidacts (a self-taught person) at some point in their life. This self-teaching and self-directed learning is safer than leaving them open to scrutiny with their peers, and saving them from having to face examinations, and the fear of failing. Some will, according to their plan for learning, avail themselves of instruction from family members, friends, or other associates. The narcissist keeps re-inventing themselves, adding new fields of knowledge as they go because, at heart, they fancy themselves as a “Renaissance Man/Woman” (who is skilled in multiple fields or multiple disciplines, and who has a broad base of knowledge). 3. 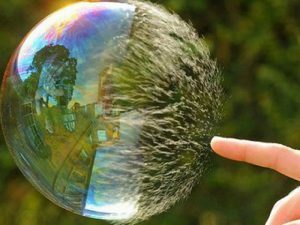 Omnipresence (being everywhere simultaneously): The narcissist sets up their environment in such a way that they are at the centre of their Kingdom. Everything that happens there revolves around them, and they controls everything within it. According to them, without their presence, the Kingdom and everyone in it would soon disintegrate, and disappear forever. Everyone and everything depends on their being there as Captain, they are the brains that “keep the boat afloat”, in-fact, according to them, without them there would be no boat. Their grandiosity makes them a powerful dictator of their little Kingdom, and all the power is theirs alone. Anything that happens there start and end with them, their word is law. Even outside of their Kingdom, when they attend meetings, they assume the role of sage, and they expect to carry a special position in any decision making. If this does not happen, they will no longer attend such meetings. 4. Omnivore (perfectionism and completeness): The narcissist is an omnivore. One striking behavioural characteristic of all omnivores is their opportunism. Omnivores must be prepared to switch rapidly from one supply resource that may be running out at the end of its ‘season’ to another as it becomes available. Just like Pac-Man, the narcissist gobbles up everything, devouring and digests all in his wake. What you have, they want, whether it is achievements, knowledge, skills, ideas, experiences, work, things etc, and they will manipulate in any way they have to in order to get whatever it is that they want. They are incapable of enjoying anything, because their one constant is the pursuit of perfection and completeness. The narcissist’s goal is to be the biggest and the best in absolutely everything they are interested in; the biggest house, the fastest car, the most money, the greatest power, be the most beautiful, and of course own the most successful business. They cannot delay gratification either, they live only in the “now”. Their greed and envy is such that they do not tolerate the word “no” in any make or shape. They have a “famine” mentality, and they do not suffer from survivor guilt. 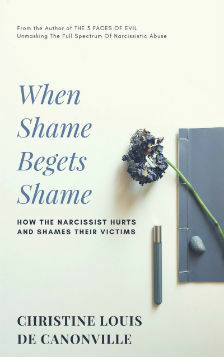 The narcissist cannot tolerate anybody having anything better than them, because it taps into their feelings of inferiority of not being good enough, not perfect enough, not smart enough, and this sends them into a rage. Their outrageous grandiosity helps to shields them from the pain that they are not perfect. Their over exaggerated stories makes them feel that they are “special”, and this boosts their ego, helping them to feel better and more important. Their grandiosity also gets them attention, and this attention feeds their obsessional need for the adoration of their False Self, a False Self that is omnipotent, omniscient, omnipresent, and omnivore. In order to survive the illusion their True Self is abandoned to the outer regions of the cosmos. Thank you for providing clarity, I’ve been confused and looking for answers for years, literally. I just divorced a narc after 30 years of marriage. He promised that he would destroy me if I left and he kept his promise. I am now homeless. All my relationships have been destroyed. He has divided my kids from me. My character has been assassinated along with the little self-esteem, or spark for life I had left. I am barely a shadow of my former self. It feels as If I have been murdered. No one here understands the impact of narc abuse or NPD. I haven’t been able to find a therapist. Any suggestions would be appreciated. Having been married to a NPD’d man for 19 years who also had a misconstrued religious side it would appear that these four components look much like how God is described in the Bible. This makes the connection for me between the grandiose self and a messianic complex, something I wish was more explored.